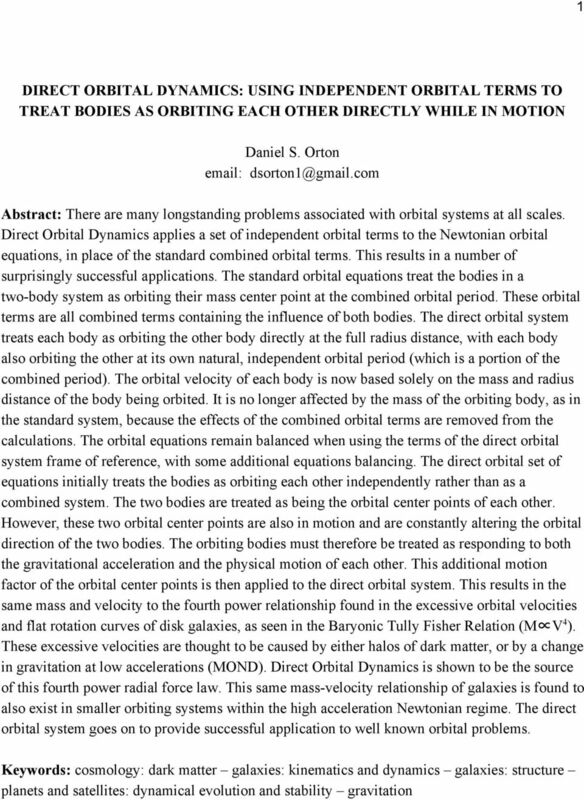 Download "DIRECT ORBITAL DYNAMICS: USING INDEPENDENT ORBITAL TERMS TO TREAT BODIES AS ORBITING EACH OTHER DIRECTLY WHILE IN MOTION"
3 3 system. 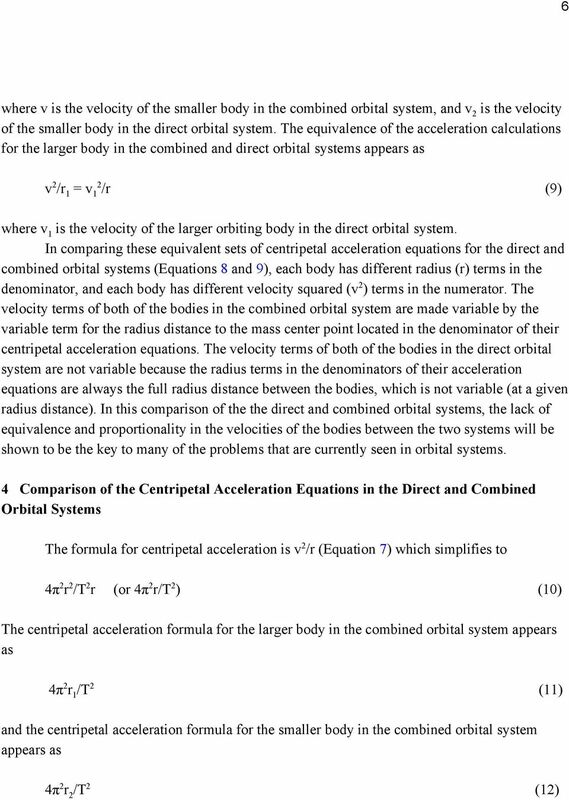 However, the orbital velocities of the two bodies in the direct orbital system are not equivalent or proportional to the orbital velocities in the combined orbital system, and this is seen within the equivalent sets of centripetal acceleration equations. This difference between the two systems is a crucial factor and has application to many of the orbital problems that are observed. In order to calculate the velocities of orbiting bodies in the direct orbital system, the individual orbital periods of the two bodies must first be calculated. This can be done by using the F=Ma equation of Newton s Second Law of Motion, inserting the full radius term into the acceleration formula, and solving for the orbital period (T). Circular orbits are assumed for simplicity in all calculations of examples. For the equivalence of the gravitational force and the centripetal force of the smaller body, F=Ma simplifies to GM 1 M /r = M 4π r /T r (or M 4π r /T ) (1) and for the equivalence of the gravitational force and centripetal force of the larger body it simplifies to GM 1 M /r = M 1 4π r 1 /T r 1 (or M 1 4π r 1 /T ) () where G is the gravitational constant (6.67 x m 3 kg 1 s ), M 1 is the mass of the larger body, M is the mass of the smaller body, r is the full radius distance, r 1 is the distance of the larger body to the center of mass of the two body system, and r is the distance of the smaller body to the center of mass. Equation 1 can be used to solve for the individual orbital period (T ) of the smaller body if the mass of the smaller body (M ) is on the right hand side. In the centripetal acceleration portion of the equation on the right, the terms for the radius distance to the center of mass (r ) must be replaced with the terms for the full orbital radius distance between the two bodies (r). Now that all the other terms are identified, the individual orbital period of the smaller body (T ) can be solved for in the equation below GM 1 M /r = M 4π r /T r (or M 1 4π r/t ) (3) where T represents the orbital period that the smaller body has relative to the larger body when the larger body is used as its frame of reference. This is the same as the orbital period the smaller body would have around the larger body if the larger body was not in motion, or if the smaller body had negligible mass relative to the larger body. Solving this equation for T would then give the individual orbital period of the smaller body relative to the frame of reference of the larger body. 4 4 Equation can be solved for the individual orbital period of the larger body (T 1 ) if the mass of the larger body (M 1 ) is instead placed on the right hand side of the equation as GM 1 M /r = M 1 4π r /T 1 r (or M 1 4π r/t 1 ) (4) where T 1 represents the orbital period that the larger body has relative to the smaller body when the smaller body is used as its frame of reference. Solving this equation for T 1 would then give the individual orbital period of the smaller body relative to the frame of reference of the larger body. The two independent, individual orbital periods of the bodies in the direct orbital system (T 1 and T ) appear in the acceleration portions of the equations above (Equations 3 and 4 ) as inverse squares: 1/T 1 and 1/T. These two components within the centripetal acceleration calculations combine together to form the inverse square of the combined orbital period (1/T ) of the two body system. This combination of terms appears as 1/T 1 + 1/T = 1/T (5) or T + T 1 = (T 1 T )/T (6) The combined orbital period is therefore composed of the individual orbital periods of the two bodies. This shows that the two bodies really are orbiting each other directly as their frames of reference in the direct orbital system, because the two individual orbital periods of the bodies (T 1 and T ) are actually present as components of the combined orbital period of the system (T). 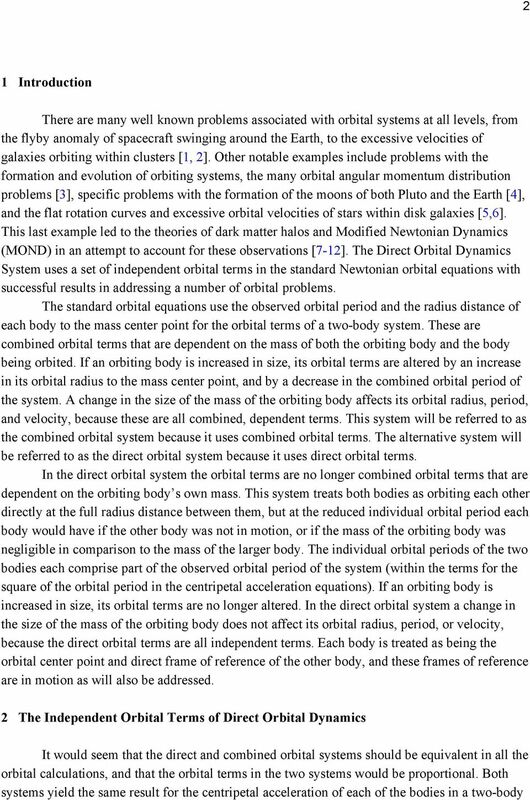 The full radius distance and individual orbital period terms of the Direct Orbital Dynamics System can now be inserted into the standard Newtonian orbital equations. The orbital terms in the direct orbital system are dependent only on the mass of the body being orbited and the full radius distance. 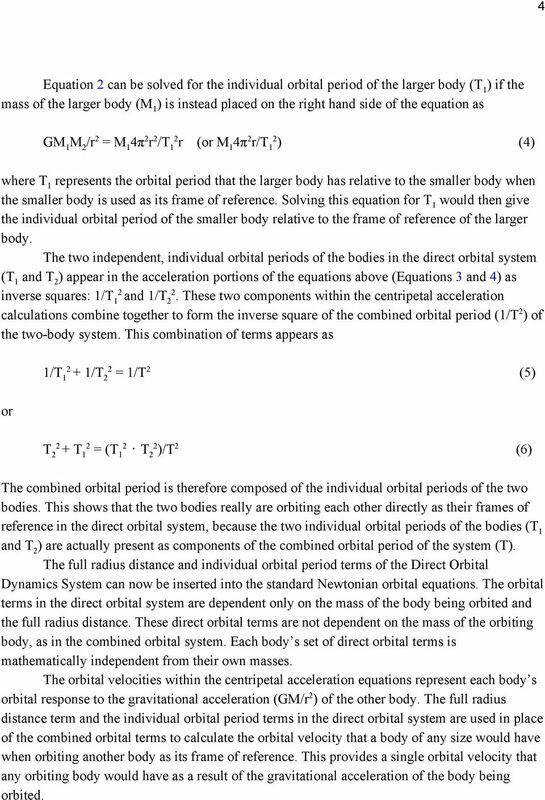 These direct orbital terms are not dependent on the mass of the orbiting body, as in the combined orbital system. Each body s set of direct orbital terms is mathematically independent from their own masses. The orbital velocities within the centripetal acceleration equations represent each body s orbital response to the gravitational acceleration (GM/r ) of the other body. The full radius distance term and the individual orbital period terms in the direct orbital system are used in place of the combined orbital terms to calculate the orbital velocity that a body of any size would have when orbiting another body as its frame of reference. This provides a single orbital velocity that any orbiting body would have as a result of the gravitational acceleration of the body being orbited. 8 8 4π r /T r = 4π r /T r (17) and like terms can be cancelled out on each side to give r /T = r/t (18) which is the same radius and orbital period relationship as in Equation 8. The two portions of the equation on the right side in Equation 16 similarly express the equivalence of the centripetal accelerations calculated for the larger orbiting body in both the combined orbital system and direct orbital system, respectively. This equivalence is 4π r 1 /T r 1 = 4π r /T 1 r (19) and like terms can be cancelled out on each side to give r 1 /T = r/t 1 (0) which is the same radius and orbital period relationship as in Equation 9. If Equation 18 is then divided by Equation 0 in order to give a ratio of the smaller body s orbital terms to the larger body s orbital terms in the two systems, the equation appears as r /T r/t r 1/T = r/t 1 (1) and by deleting like terms on both sides it becomes r 1/T r = 1 1/T 1 () or the expression on the right can be inverted to give r T r = 1 1 T (3) which gives the relationship between the radius variables in the combined orbital system to the squared orbital period variables in the direct orbital system. 10 10 M 1 (πr/t ) = (πr/t ) M 1 (8) It is the squares of the orbiting velocities of the two bodies that are inversely proportional to the masses of the bodies in the direct system. This is very different from the velocities in the combined orbital system shown in Equation 6. If we take the square root of each side of Equation 8, then the velocities of the bodies in the direct orbital system are inversely proportional to the square roots of the masses. This equation appears as M 1 πr/t = πr/t 1 M (9) Both the combined orbital system and the direct orbital system calculate the same centripetal accelerations for the bodies in a two body orbital system. But they do so with different sets of orbital terms. This difference in terms causes the velocities in the combined orbital system to be inversely proportional to the masses of the bodies, while it causes the squares of the velocities in the direct orbital system to be inversely proportional to the masses (before the inclusion of the additional motion factor of the orbital center points in Section 7). 6 The Application of Direct Orbital Dynamics to the Orbital Equations The terms used in the orbital equations for the Direct Orbital Dynamics frame of reference are the full radius distance between the bodies (r), the individual orbital period of the smaller body relative to the larger (T ), and the individual orbital period of the larger body relative to the smaller (T 1 ). These terms can be inserted into all the standard Newtonian orbital equations with successful results that balance the equations. 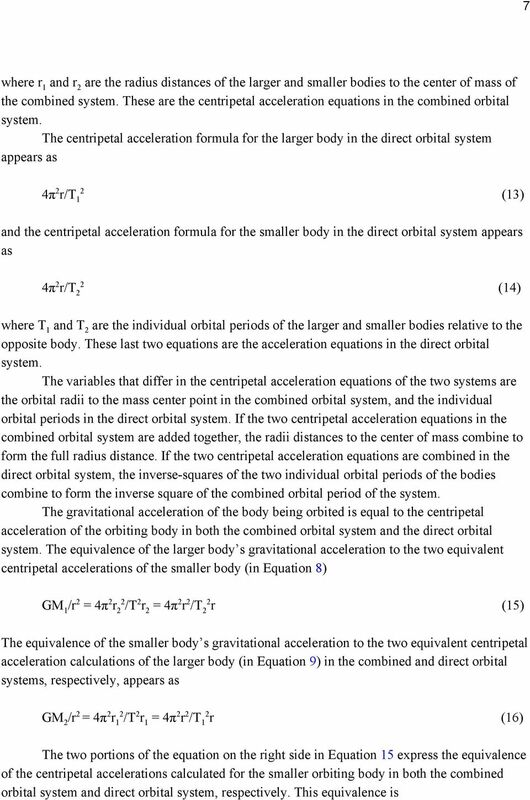 These calculations provide the direct orbital response of each body to the gravitational equations without using the combined terms of the standard system. 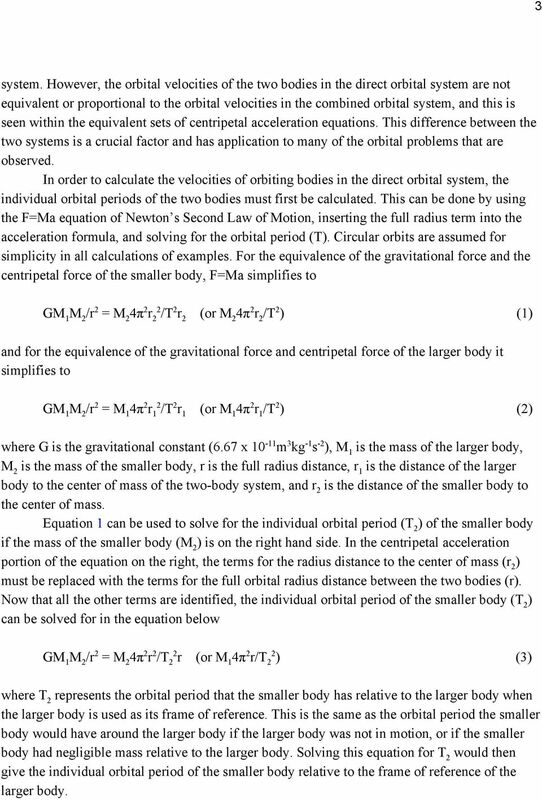 This set of equations is important because it shows the gravitational action and orbital reaction taking place in the direct orbital system before the factoring in of the interactive motion of the two bodies and their orbital center points in the next section. This set of gravitational and orbital equations with actual calculations is located in the middle column of Table below, with the first column containing the combined orbital system calculations for comparison, and the third column containing the direct orbital system with the application of the additional motion factor. The calculations for the orbital angular momentum of the two bodies will be addressed separately in the next section as well, as they carry another important difference. 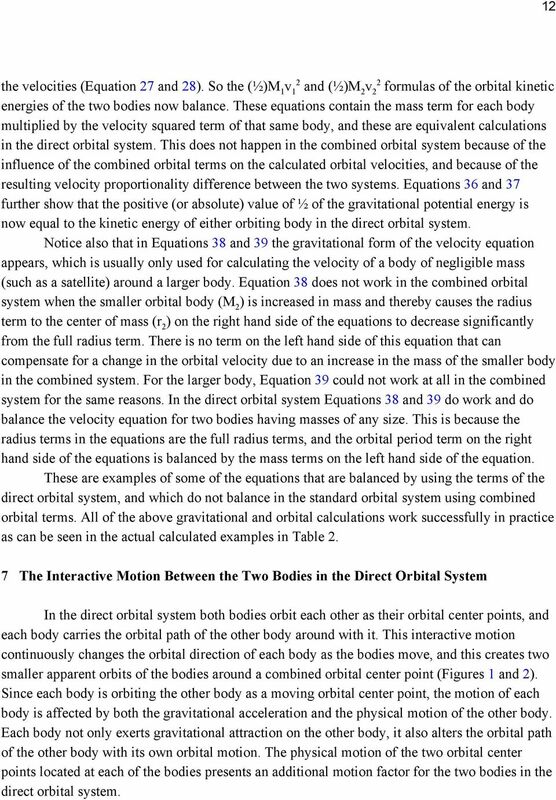 Below are the gravitational and equivalent orbital equations of the direct orbital system. 12 1 the velocities (Equation 7 and 8 ). 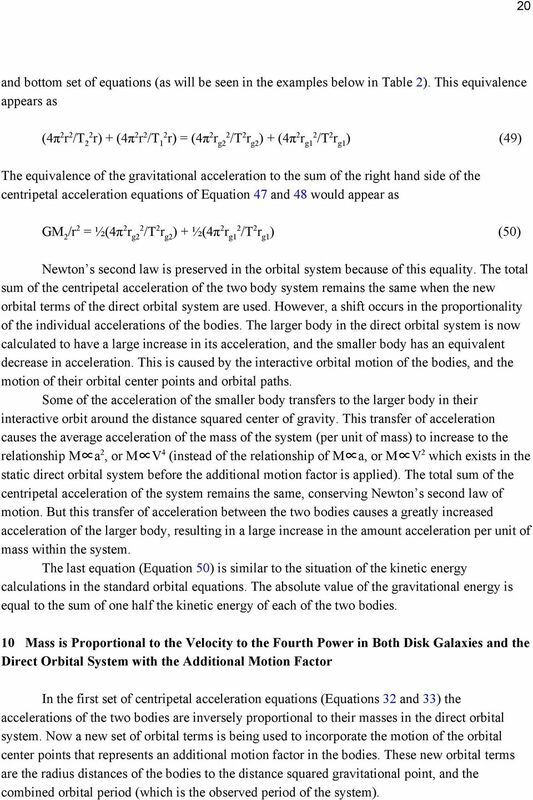 So the (½)M 1 v 1 and (½)M v formulas of the orbital kinetic energies of the two bodies now balance. 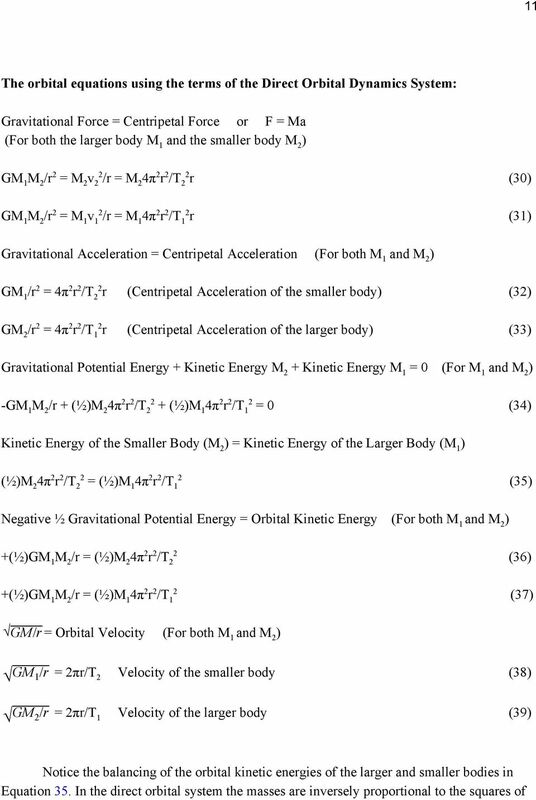 These equations contain the mass term for each body multiplied by the velocity squared term of that same body, and these are equivalent calculations in the direct orbital system. 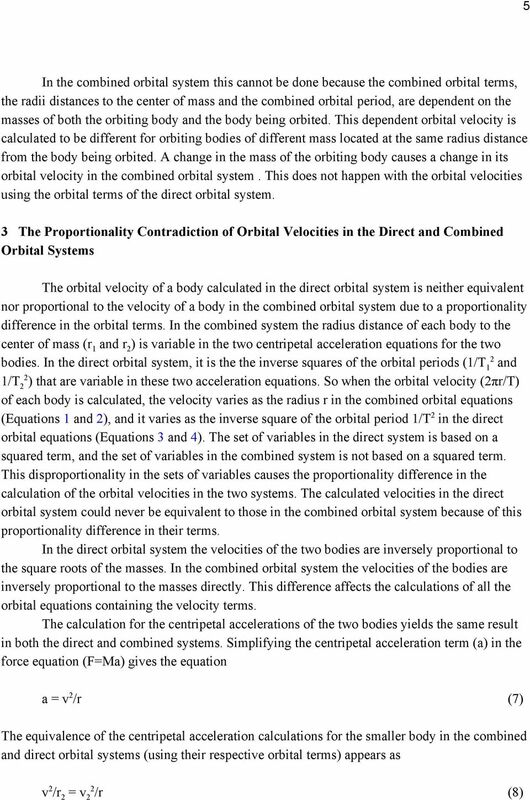 This does not happen in the combined orbital system because of the influence of the combined orbital terms on the calculated orbital velocities, and because of the resulting velocity proportionality difference between the two systems. 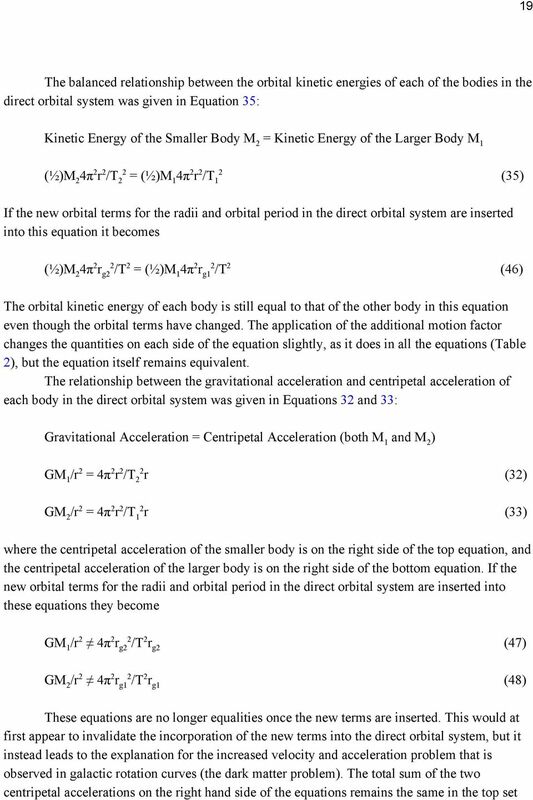 Equations 36 and 37 further show that the positive (or absolute) value of ½ of the gravitational potential energy is now equal to the kinetic energy of either orbiting body in the direct orbital system. 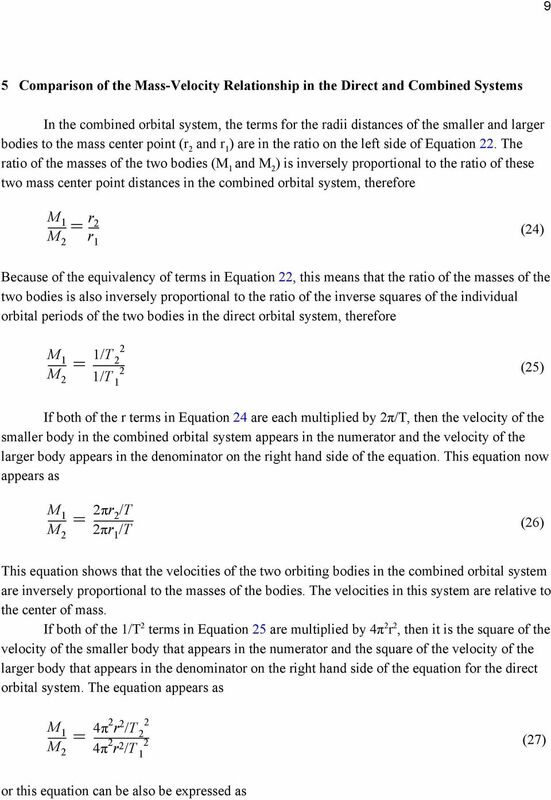 Notice also that in Equations 38 and 39 the gravitational form of the velocity equation appears, which is usually only used for calculating the velocity of a body of negligible mass (such as a satellite) around a larger body. Equation 38 does not work in the combined orbital system when the smaller orbital body (M ) is increased in mass and thereby causes the radius term to the center of mass (r ) on the right hand side of the equations to decrease significantly from the full radius term. There is no term on the left hand side of this equation that can compensate for a change in the orbital velocity due to an increase in the mass of the smaller body in the combined system. For the larger body, Equation 39 could not work at all in the combined system for the same reasons. In the direct orbital system Equations 38 and 39 do work and do balance the velocity equation for two bodies having masses of any size. This is because the radius terms in the equations are the full radius terms, and the orbital period term on the right hand side of the equations is balanced by the mass terms on the left hand side of the equation. 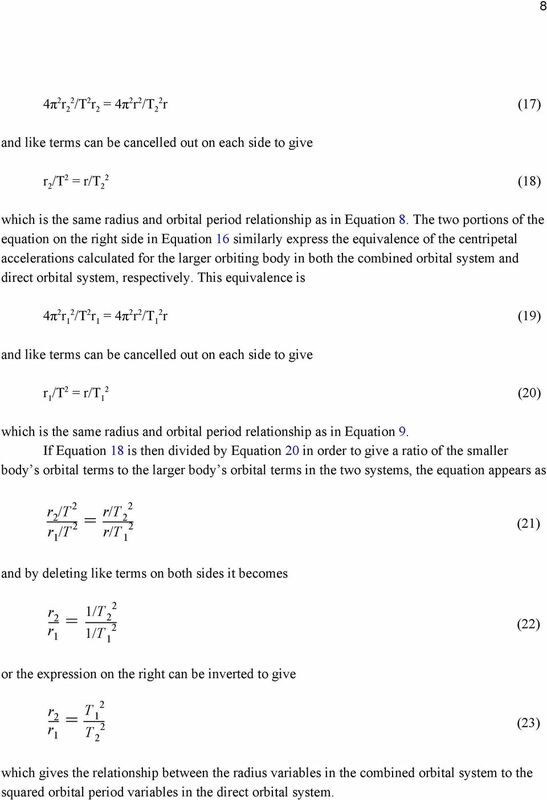 These are examples of some of the equations that are balanced by using the terms of the direct orbital system, and which do not balance in the standard orbital system using combined orbital terms. All of the above gravitational and orbital calculations work successfully in practice as can be seen in the actual calculated examples in Table. 7 The Interactive Motion Between the Two Bodies in the Direct Orbital System In the direct orbital system both bodies orbit each other as their orbital center points, and each body carries the orbital path of the other body around with it. This interactive motion continuously changes the orbital direction of each body as the bodies move, and this creates two smaller apparent orbits of the bodies around a combined orbital center point (Figures 1 and ). Since each body is orbiting the other body as a moving orbital center point, the motion of each body is affected by both the gravitational acceleration and the physical motion of the other body. Each body not only exerts gravitational attraction on the other body, it also alters the orbital path of the other body with its own orbital motion. 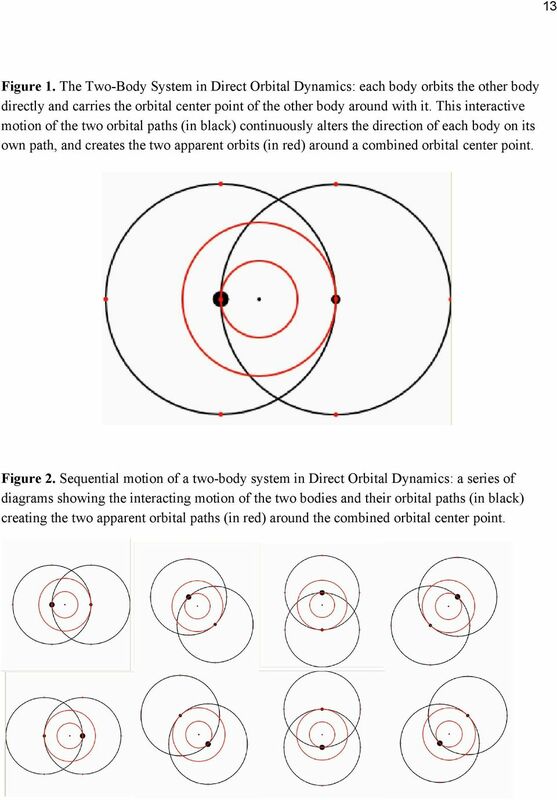 The physical motion of the two orbital center points located at each of the bodies presents an additional motion factor for the two bodies in the direct orbital system. 13 13 Figure1. TheTwo BodySysteminDirectOrbitalDynamics:eachbodyorbitstheotherbody directlyandcarriestheorbitalcenterpointoftheotherbodyaroundwithit.thisinteractive motionofthetwoorbitalpaths(inblack)continuouslyaltersthedirectionofeachbodyonits ownpath,andcreatesthetwoapparentorbits(inred)aroundacombinedorbitalcenterpoint. Figure. Sequentialmotionofatwo bodysystemindirectorbitaldynamics:aseriesof diagramsshowingtheinteractingmotionofthetwobodiesandtheirorbitalpaths(inblack) creatingthetwoapparentorbitalpaths(inred)aroundthecombinedorbitalcenterpoint. 18 18 occurred with the balancing of the kinetic energies of the two bodies (Equation 35 ) and with the balancing of the two types of velocity equations (Equations 38 and 39 ). The orbital angular momentum of the larger body (M 1 ) equals the orbital angular momentum of the smaller body (M ). In the orbital angular momentum equations for the direct orbital system this appears as M 1 (πr g /T)r g = M (πr g1 /T)r g1 (44) which reduces to M 1 r g = M r g1 (45) where r g1 is the radius distance of the larger body to the distance squared center of gravity orbital center point, and r g is the radius distance of the smaller body to this distance squared orbital center point. The combined orbital period term (T) is now being used in the orbital angular momentum equations, along with radius distance terms of each of the bodies to the distance squared center of gravity orbital center point of the direct orbital system. 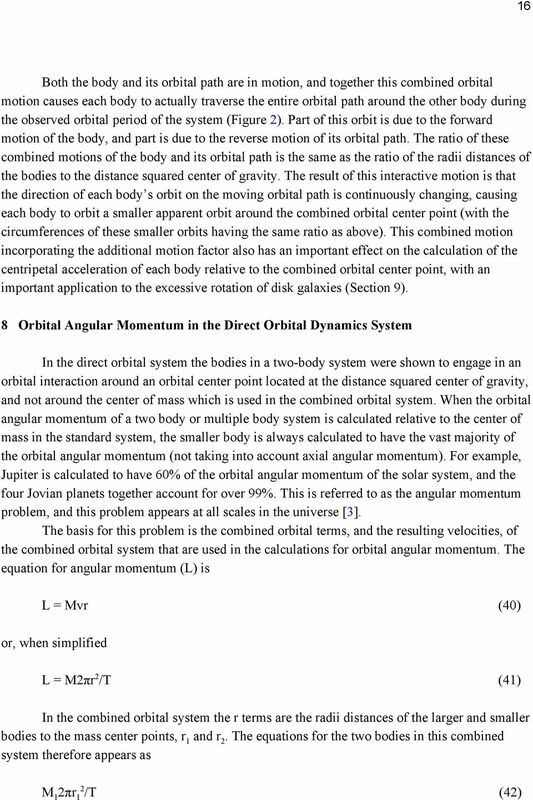 9 The Application of the Additional Motion Factor to Direct Orbital Dynamics The orbital radius terms of the larger and smaller body to the distance squared gravitational center point (r g1 and r g ), along with the combined orbital period (T) of the two body system, can now be applied to the other orbital equations in the direct orbital system. These terms replace the full radius term (r) and the individual orbital period terms (T 1 and T ) used up until now in this direct system. These direct terms were used to calculate the individual orbital response of each body to the gravitational attraction of the other body, with each body being treated as the the orbital center point of the other body. 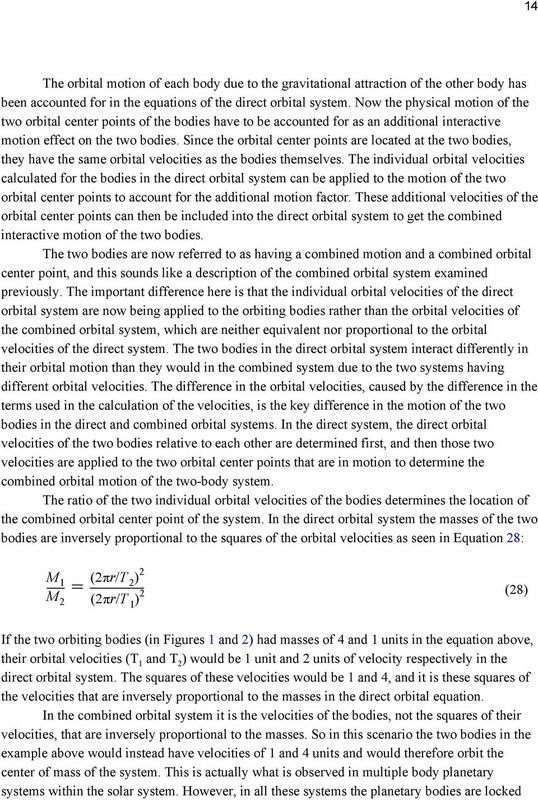 The reason for applying the new set of orbital terms is to incorporate the orbital velocities of these two orbital center points, which are located at the bodies. The motion of these orbital center points represents an additional motion factor affecting the combined orbital motion of the two bodies. 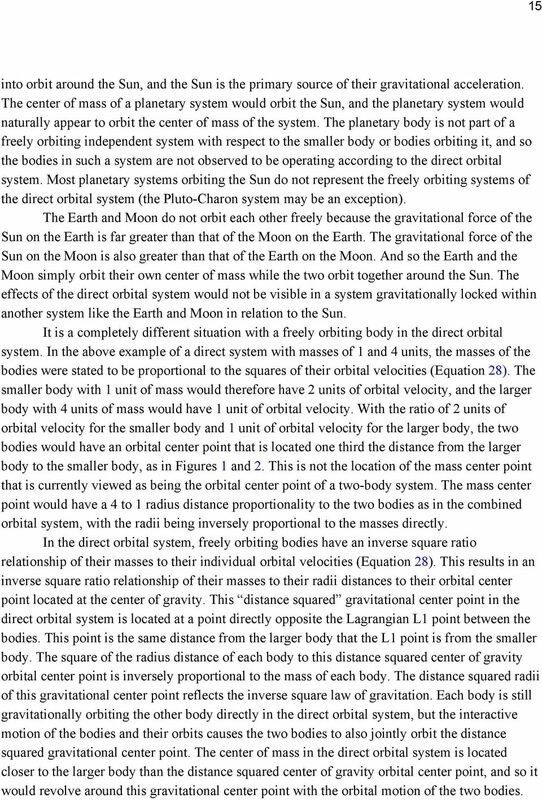 The proportionality of the orbital velocities in the direct orbital system defined the location of the combined orbital center point to be at the distance squared center of gravity. The newly defined radius terms to the distance squared gravitational center point were applied to the orbital angular momentum equations, along with the combined orbital period term of the system. The orbital angular momentum of each of the two bodies was calculated to be equivalent and balanced when using these terms (Equation 44 ). 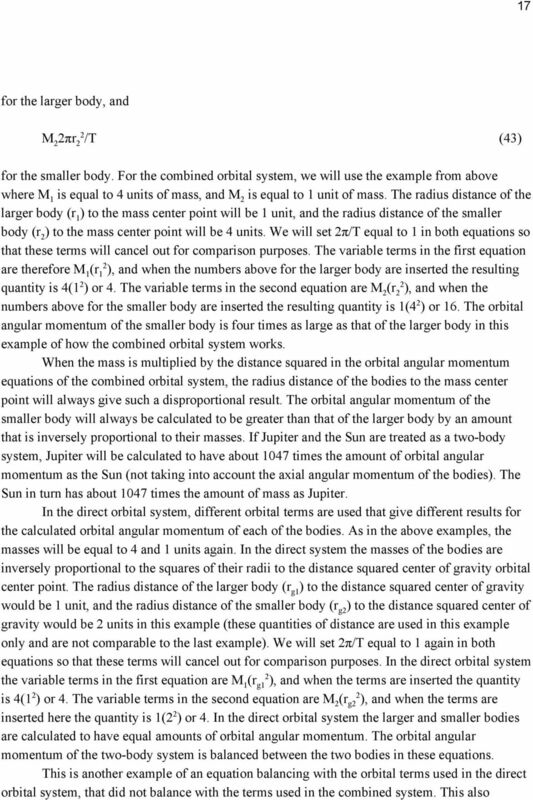 If these terms of the direct orbital system are applied to the orbital angular momentum calculations for Jupiter and the Sun as an example, these quantities are also calculated to be equal and balanced (in the third column of Table ). This result would be the same for a binary star system, a pair of orbiting galaxies, a star and its planet, or any two body system. 20 0 and bottom set of equations (as will be seen in the examples below in Table ). This equivalence appears as (4π r /T r) + (4π r /T 1 r) = (4π r g /T r g ) + (4π r g1 /T r g1 ) (49) The equivalence of the gravitational acceleration to the sum of the right hand side of the centripetal acceleration equations of Equation 47 and 48 would appear as GM /r = ½(4π r g /T r g ) + ½(4π r g1 /T r g1 ) (50) Newton s second law is preserved in the orbital system because of this equality. The total sum of the centripetal acceleration of the two body system remains the same when the new orbital terms of the direct orbital system are used. However, a shift occurs in the proportionality of the individual accelerations of the bodies. The larger body in the direct orbital system is now calculated to have a large increase in its acceleration, and the smaller body has an equivalent decrease in acceleration. This is caused by the interactive orbital motion of the bodies, and the motion of their orbital center points and orbital paths. Some of the acceleration of the smaller body transfers to the larger body in their interactive orbit around the distance squared center of gravity. This transfer of acceleration causes the average acceleration of the mass of the system (per unit of mass) to increase to the relationship M a, or M V 4 (instead of the relationship of M a, or M V which exists in the static direct orbital system before the additional motion factor is applied). The total sum of the centripetal acceleration of the system remains the same, conserving Newton s second law of motion. But this transfer of acceleration between the two bodies causes a greatly increased acceleration of the larger body, resulting in a large increase in the amount acceleration per unit of mass within the system. The last equation (Equation 50 ) is similar to the situation of the kinetic energy calculations in the standard orbital equations. The absolute value of the gravitational energy is equal to the sum of one half the kinetic energy of each of the two bodies. 10 Mass is Proportional to the Velocity to the Fourth Power in Both Disk Galaxies and the Direct Orbital System with the Additional Motion Factor In the first set of centripetal acceleration equations (Equations 3and 33 ) the accelerations of the two bodies are inversely proportional to their masses in the direct orbital system. 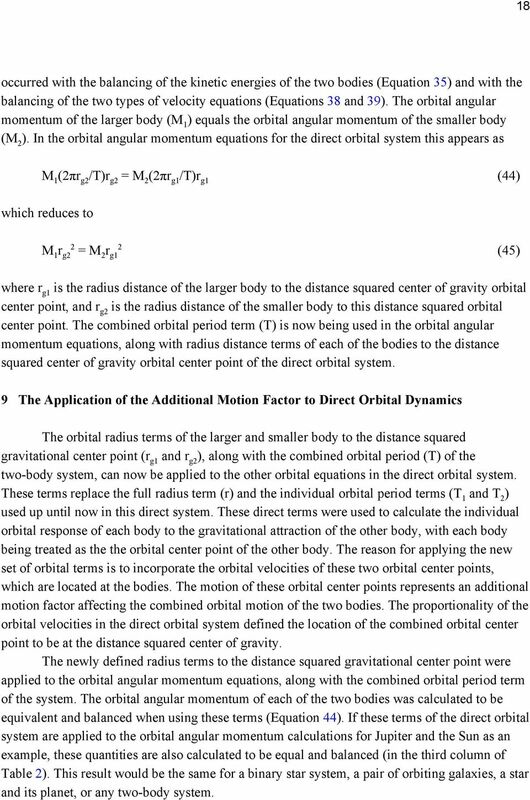 Now a new set of orbital terms is being used to incorporate the motion of the orbital center points that represents an additional motion factor in the bodies. These new orbital terms are the radius distances of the bodies to the distance squared gravitational point, and the combined orbital period (which is the observed period of the system). GRAVITATION CONCEPTS Kepler's law of planetry motion (a) Kepler's first law (law of orbit): Every planet revolves around the sun in an elliptical orbit with the sun is situated at one focus of the ellipse. STATICS. 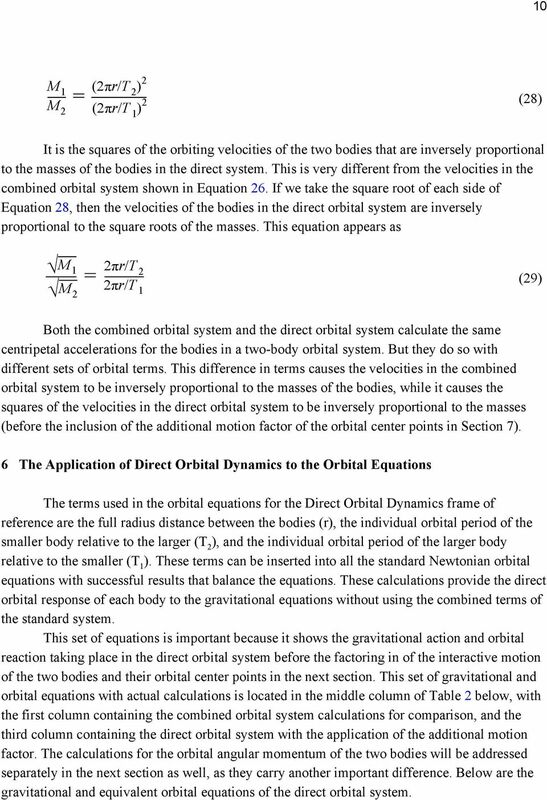 Introduction VECTOR MECHANICS FOR ENGINEERS: Eighth Edition CHAPTER. Ferdinand P. Beer E. Russell Johnston, Jr.